After hitting a speed of over 180 kmph during a trial run on a section of the Delhi-Rajdhani route, Train 18 has now become the fastest train in the country. New Delhi: Railways Minister Piyush Goyal on Monday tweeted a video of India’s first engineless train built under Make in India. Train 18, also known as the Vande Bharat Express, is scheduled to be inaugurated by Prime Minister Narendra Modi on February 15 from the New Delhi Railway station. 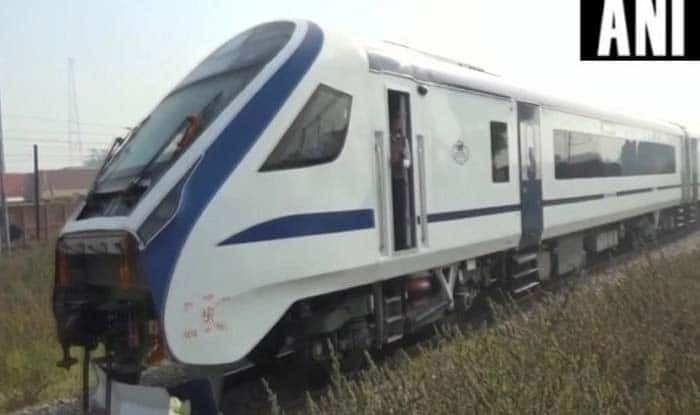 The train is set to run between Delhi and Varanasi at a maximum speed of 160 kmph and will stop at Kanpur and Allahabad. Train 18 is manufactured by the Integral Coach Factory, Chennai. The entire cost of the 16-coach train sums up to Rs 97 crore. The train will cover a total distance of 755 km in a matter of eight hours. The current fastest train takes around 11-and-a-half-hours to complete the journey. It is considered a successor to the 30-year-old Shatabdi Express. After hitting a speed of over 180 kmph during a trial run on a section of the Delhi-Rajdhani route, Train 18 will now become the fastest train in the country. Meanwhile, officials said that the meals on board the soon-to-be-launched Vande Bharat Express will not be optional for passengers unlike in premium trains such as Shatabdi, Rajdhani and Duronto express, where travellers can choose not to take catering services. However, passengers travelling the last leg on the route of the semi-high speed train — Allahabad to Varanasi — will have the choice of opting out of the meals provided by the Indian Railways Catering and Tourism Corporation (IRCTC), in advance while booking their tickets.